The figure published as Figure 2 in the original published version of the manuscript isin fact a duplicate of Figure 5. The correct Figure 2 is shown here (Figure 1 in this correction). Note that the legend for Figure 2 andreferences to it in the main text apply to the correct Figure 2. The authors andpublisher regret the error. 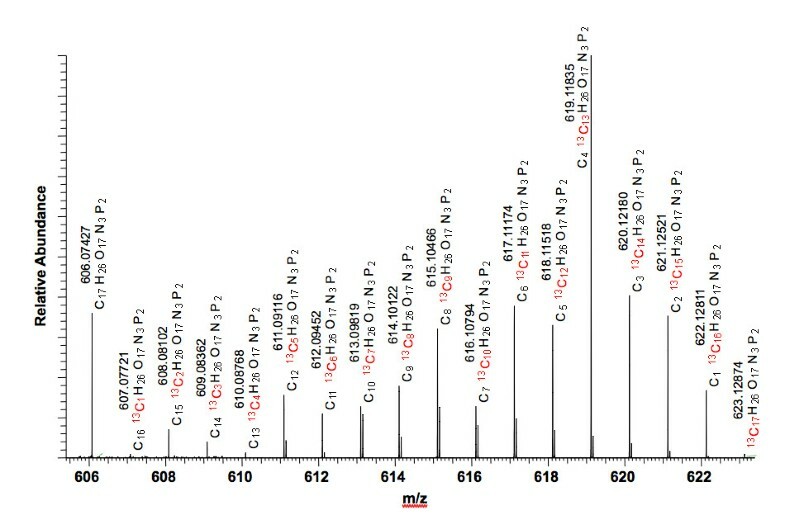 Species assignments of UDP- N -acetyl-D-glucosamine (UDP-GlcNAc)isotopologues in Fourier transform-ion cyclotron resonance-mass spectrometry(FT-ICR-MS). The same crude extracts used for NMR were analyzed followingre-exchange of 2H back to 1H. Analysis conditions are statedin the text. 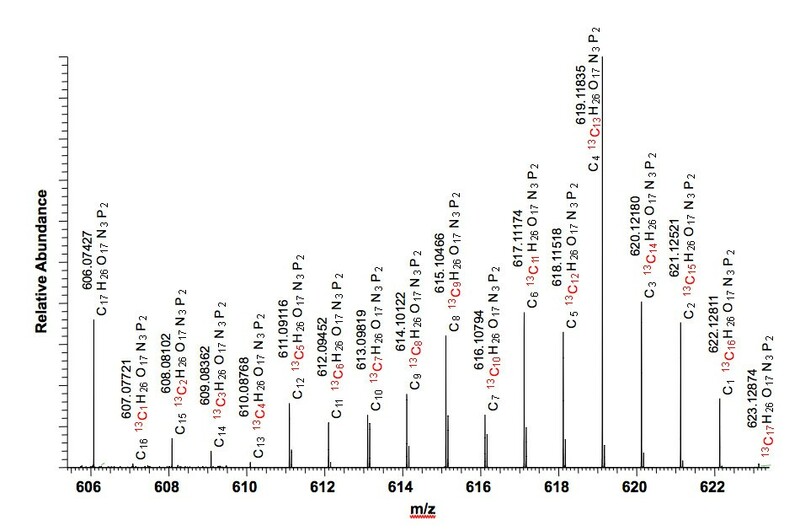 With correction to an internal reference, all of the isotopologueswere assignable at better than 1 ppm mass accuracy, with most better than 10 ppbmass accuracy. The molecular formulae were assigned using Xcalibur software withelemental limits set to CHONP and allowing up to 17 occurrences of 13C.The combination of the ultra-high resolution with extreme mass accuracy resultedin high confidence that only 'pure' 13C isotopologues were quantifiedfor the moiety modeling.